This is a very good Internet radio that can work wired or wireless, stereo not mono as some are and the first plus is that it can also be used to play the content from your iPod. The second plus you will need to read on to find out about. 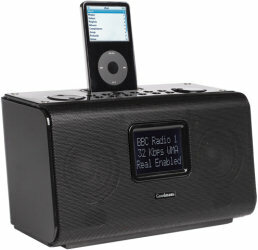 This WiFi Internet radio from Goodmans is 25x11x14cm and shiny black with a matt black front grill that has the 6x4cm four line LCD display sunk into it. The top has two rows of six push buttons with a large touch wheel at either end. All are clearly labelled and unless you are a total novice setting up will be simple. The other connections are on the back outputs for earbuds and a stereo along with the Ethernet input. The mains lead also emerges from the base of the back. Finally at the back of the top is the iPod connection and various sleeves to fit a whole range of them are provided in the box. If you use an Ethernet cable it is just a case of plugging it in and switching on. Select your genre and then possibly the country. It then finds all available stations of that type select one and after a few seconds of buffering then you hear whatever it is broadcasting. From switch on to hearing a 128kbps stream is around 50 seconds remember some Internet radio has far less quality so the buffering is quicker. For those opting for the 'wireless' option there are two extra steps and they are to select the router and then enter the passcode. As there is no keyboard this will take a couple of minutes. All the possible characters are shown in a stream -remember it will be case sensitive- and once selected it will be remembered by the unit so this is a one time setting. Of course if you move to another router or change the passcode then it will need to entered again. But even if you do not use the unit for weeks it still remembers. From switch on to hearing a 128kbps stream is around 50 seconds remember some Internet radio has far less quality so the buffering is quicker. I used it mainly on 'wireless' as this is using more of it's capabilities. I live in a bungalow and the router sits on the floor of the lounge behind the couch. I could happily plug the unit into the mains in any room and even used it -via an extension lead- in my back garden. Yes it would have been nice to have it work on rechargeable batteries so it could work without the mains lead. Should it be required there is a forty page A5 instruction manual. It has lots of illustrations with blue on black that are not the easiest to read unless you get the light correct. The actual display on the unit is white on black and easy to read. The manual has four sections pages 2-14 cover the Internet radio. Page 15 covers the iPod. Pages 35-40 covers specifications and guarantee. So what you may ask is covered on pages 16-34. It is an ability I have yet to mention it can work as a media player using universal plug n play (UpnP) and once setup you cannot get it to play DRM encrypted content however. I had been happily using the unit for a couple of weeks and remember wondering on a few occasions what several of the 12 buttons did as pressing them in Internet radio mode had no result. The buttons in question were PS(with a solid square after it) Skip - Skip + and Play/Pause. On further testing I found that Browse and Reply also seems to produce no result. Use the media player (I would advise reading the relevant pages first) and all becomes clear. This is a Reciva unit (the company I first told you about some years ago when I saw a hand built prototype) and when you register on their site you get an option to add steams stations and even Podcasts to 'My Stuff' for easy access. These units get better and better it bears little to the original prototype and extra abilities abound. Another feature I have not mentioned is that it has an Alarm Clock. Bought one of these yesterday - took 10 minutes to configure - really cool product! Did an over-the-air firmware upgrade straight away. Product very stable.